Photographed by Robert Shantz north of Morenci, Arizona, 31 March 2004. In the middle to upper elevations of Arizona's sycamore woodlands this sprite and active warbler shows its plumage like a butterfly. As it forages for insects on the trunks, branches and ground beneath trees it often fans its tail and spreads its wings seeming just to show off. As a warbler, it has a fine beak for capturing mostly soft-bodied prey. Males and females look similar. During the winter months they are scarcer, but not absent completely. 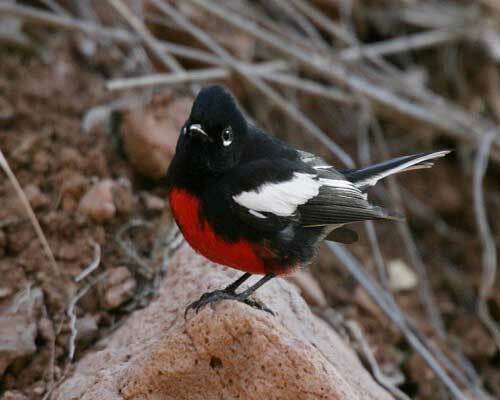 From 1200 m up to 2000+ m elevation, especially in southeastern Arizona, it is a common and conspicuous bird during the spring and summer months. Copyright Michael J. Plagens, page created 4 Nov. 2009.